Author(s): Makoto Akeo, Hiroshi Hashimoto, Taisuke Kobayashi, Tetsuo Shibusawa. Article: Computer Graphics Forum, Vol. 13, No. 3, pp. 477--488, 1994. This paper describes the technical features and method of implementation of our designer support system which enables reproducing a three-dimensional shape from an idea sketch speedily and modifying the reproduced shape easily, thereby facilitating the consistency of the shape to be checked from a design viewpoint. The designer support system was developed as a tool to cut the time and labor designers have to spend in the design process and help designers to fully display their creativity--the essential attribute of designers. This system uses cross-section lines of an idea sketch of an object drawn by an industrial designer as input data to reproduce automatically a three-dimensional wire frame model of the object by a newly developed three-dimensional graphic algorithm including graphic constraints. In addition, it automatically creates planes by scanning the area enclosed by reproduced curved lines and subjects them to shading. 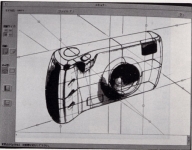 In this process, the dimensions of the object need not be input to the system. The designer can operate the system simply by using the mouse to input appropriate data. Thus, the system permits the designer to easily express his idea in the form of a three-dimensional shape and study idea variations on the display screen without creating a mockup.